Peregrine Island is a private island that has been in the Peregrine family for many generations. In this novel by Diane B. Saxton, the focus is on three of the women in the family: the matriarch Winter, the difficult daughter Elsie, and an imaginative, inquisitive granddaughter named Peda. Needing a place to live, Elsie moved home to Peregrine Island. She and her mother Winter do not have a strong, loving relationship; Peda is the tie that binds them. When Peda finds a special friend in an elderly, homeless man named Jake and his dog Scarecrow, the women are not too concerned about her interactions with him. They also aren’t concerned about a voice that seems to scream for help every night. Winter’s main focus is on a painting that was passed down from her father. The artist was a friend of the family who is believed to have been murdered. The past rapidly enters into the present when an unusual group of characters show up expressing interest in this painting. Each person has his own selfish reasons for wanting to have a piece of this artwork. The mystery continues when more paintings and writings by the artist are discovered hidden on the back of the canvas. The mystery deepens when the police become involved. The past is going to haunt the future until the secrets of the painting are revealed. “Peregrine Island” is composed of a cast of eccentric, flawed characters. While none of them are very likeable, they are certainly entertaining! The author does a beautiful job of weaving a storyline around a mysterious piece of art. As I read, I was reminded of the whodunits from the old days, where people would gather in the parlor to go over clues knowing that the guilty party was among them. The grand finale also holds to that style, and was not a disappointment. 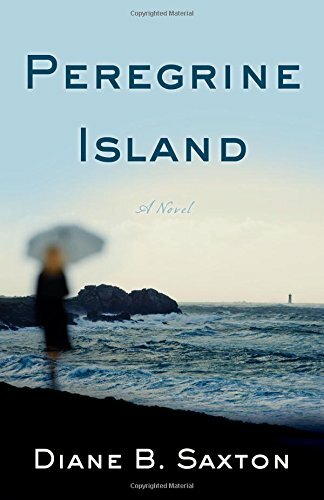 I highly recommend “Peregrine Island” by Diane B. Saxton for fans of murder mysteries. It would also make a great selection for a reader’s group. The author’s vivid descriptions and cast of eccentric characters are meant to be discussed and shared among others.